A frenzied, screwball comedy with a lighter-than-light touch, "Nurse Betty" is a radical departure for director Neil LaBute, who helmed the vitriolic "In the Company of Men" and "Your Friends and Neighbors". Betty (Ren?©e Zellweger) is a perky Kansas waitress whose sole happiness comes from her obsession with the television soap "A Reason to Love", starring dreamboat doctor David Ravell (Greg Kinnear). When her slimy car-dealer husband (Aaron Eckhart) enters into a drug transaction that goes horribly awry, Betty inadvertently witnesses the carnage and, in shock, becomes Nurse Betty, determined to reunite with her long-lost love, Dr. Ravell. Tailed by two hit men (Morgan Freeman and Chris Rock), Betty heads to L.A. a determined woman, unaware she has their huge drug stash in tow. Though it takes a good half-hour to get going, once LaBute and the movie hit top speed, it's a surreal, often brilliant ride, as Betty's fantasy and reality collide, with unexpected ("really" unexpected) developments. The screenplay (by John C. Richards and James Flamberg) is wickedly inventive, and like his previous films, LaBute has assembled a peerless cast. Zellweger is charming and daffy in her best performance since "Jerry Maguire", and Freeman is by turns menacing and touchingly romantic in his obsession with Betty. Kinnear is the epitome of self-serving shallowness (and makes us love him all the more for it), and Rock finally shakes his standup persona and emerges as a great comic actor. Look also for a scene-stealing Allison Janney as the producer of Kinnear's soap. 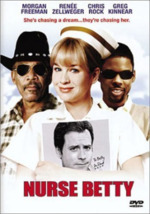 Most movies rarely get such talent operating at full capacity, and "Nurse Betty" soars because of it. " --Mark Englehart"